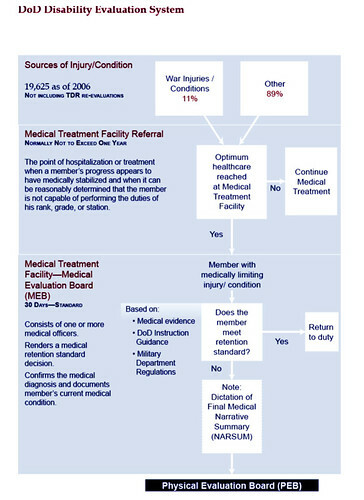 This HEALTH ENROLLMENT process map addresses such questions as how does a veteran enroll with VA for medical care and how much time is required for each step? 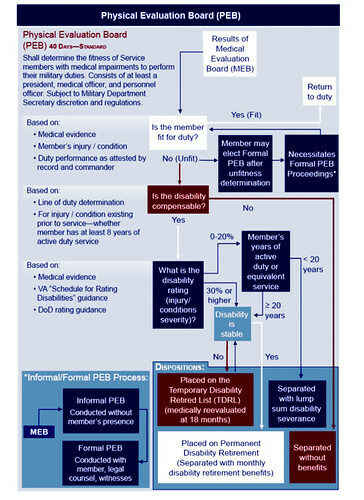 The enrollment process in this chart is for veterans who are new to VA and represents the critical path at a high level. The associated times are estimated and may fluctuate depending on the time the application entered the enrollment system and the volume of activity in the system. The goal is to send the letter to the veteran in 7 days, but it could range to 10 days. The health enrollment process consists of the following steps. 1. The veteran may apply for enrollment in person at a VA health care facility, by mail, or by completing an on-line application. VHA uses the military service, demographic and, as applicable, financial information collected on the application form as the basis for determining whether the veteran qualifies for VA health care benefits. 2. The local VA health care facility receives the application for enrollment and intake staff enters the data into the Veterans Integrated System Technology Architect (VistA). VistA automatically queries the Master Patient Index (MPI) to determine if a record has already been established, if not it uniquely identifies the veteran record. At this time, the intake staff may also query VBA for compensation and pension and/or known military status information. Typically, the veteran is provided a preliminary eligibility determination at the conclusion of an in-person application for enrollment. 3. VistA transmits the veteran data to the Eligibility and Enrollment System (national system). 4. The Eligibility and Enrollment System establishes the veteran record and queries the SSA to verify the veteran’s SSN. Note: SSN verification does not occur in real time and is not on the critical path. 5. The Enrollment System queries VBA to reconfirm the compensation and pension and/or military status. 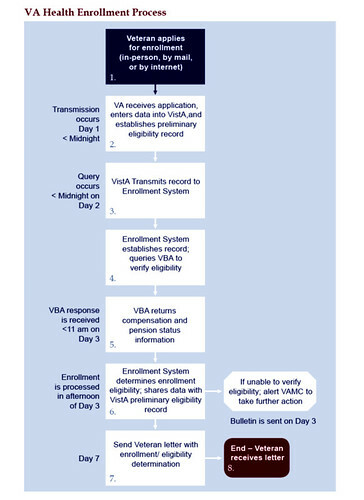 Currently, this is done in a batch mode, however, when VHA deploys Enrollment System Redesign (ESR), the Enrollment System will immediately trigger a query to VBA; as a result the cycle time, noted above, for the enrollment process will be reduced by another day. 6. The Enrollment System verifies the veteran’s enrollment eligibility and shares this data with VistA (at the local level). Note: If the Enrollment System is unable to verify eligibility, then the system sends the local VA Medical Center a bulletin to alert them to take further action (i.e. confirm whether the veteran has qualifying military service). The Enrollment System establishes an enrollment record upon transmission of verifying data by the local station. 7. The Enrollment System produces the letter to the veteran with the official enrollment determination. 8. The veteran receives the letter from VA telling him or her about their eligibility and enrollment determination.